We will figure the material needed for your crawl space as well as guide you on how to install it. This can save you many, many hours of work and frustration. By having a plan on how the material will be cut and installed before you start your project you will be better prepared as well as less likely to make costly mistakes. Although creating a conditioned crawl space in your home can be done by most homeowners, it is still difficult work. The more you know before you get in the dirt the less time you will spend there. 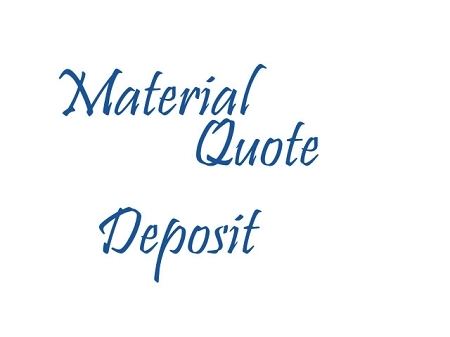 To help us separate the curious from the serious we take a $50.00 USD deposit before we figure your quote and layout. This $50.00 is credited back to you on your order, so it will cost you nothing in the end. This measure was put into place to insure we are able to spend the time needed with the customers that are ready to finish their crawl space. This way we will be ready when you're ready. Click the "Add to Cart" button above to place your order for a material quote. Once you have completed this process you can send your sketch by fax- 864.223.7803 or email to tech(at)crawlspacerepair.com , Please include your order number to speed the process. Top quality service and materials. I could not be happier with the product. Hi, Just finished installing your product in our dirt basement. It took me and a friend about 3 days to install it like you said. The work was not too hard but a bit dirty at first and a bit of a puzzle but your sketches helped. We ended up short of one bag of pins but I was able to get similar product (although black) at Lordco, (a motor vehicle part retailer). I was also short of one caulking tube but easily got another vapor barrier adhesive tube (although black) at a Home renovation centre. The material list was otherwise OK. My basement is dry, looks and smells great now! Thanks! I am extremely happy with the service I received. I submitted my plans on Friday and by Wednesday I had my call back. Larry was extremely helpful; he supplied drawings, answered numerous questions, went over my material, and directed me to some helpful video. I received all material within 3 days of confirming my order and everything arrived in excellent shape. The install was easier than I expected. I would highly recommend this company and the use of their Material Quote. I must comment on the outstanding service provided by Larry. He was always available by telephone or e-mail, provided the estimates of material needed based on my sketches, and provided several pages of sketches on how to proceed with the job. This kind of assistance was essential to me in deciding to proceed with the encapsulation myself, and your web site is one of the most informative and helpful I have ever encountered. The material quote was a great value to be to ensure I purchased the right material and installed it correctly. This service could only have been better if it was completed in a more timely manner. I had to follow-up with the company two to three days after the request and again later to get the quote finalized. Also, I had to follow-up after my material purchase to receive my $50 discount from purchasing the material quote service. I appreciate Crawlspace Concepts commitment to quality products, excellent customer service and support on my installation questions. We saved approximately $7200 by doing this project on our own.